I'm slowly beginning to realize that guitar building is a peculiar thing! I was very nervous about bending the sides by hand on a hot pipe, but to my surprise it went quite smoothly. When it came to adding kerfed linings to the sides, I thought it was going to be a piece of cake. After all it's just gluing a little strip of wood onto another. How hard can that be? Wrong!!! It soon became apparent that they were next to impossible to manipulate without snapping them left, right and center even though I try to handle them very careful. Where did this come from? 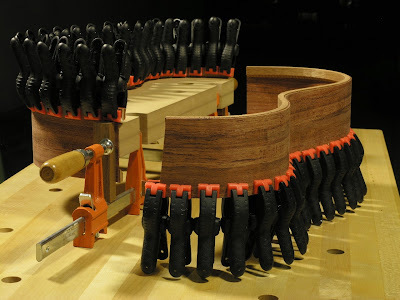 Being at a loss of what to do I read through my books on guitar building, "Build Your Own Acoustic Guitar" by Jonathan Kinkade being one of them. 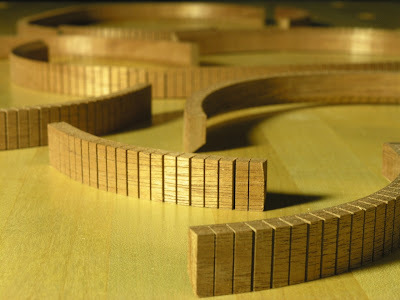 In the section about kerfed linings he mentions that "the kerfing strips are easier to manage when they are cut into 6" strips". This little sentence suddenly got a whole new meaning. I also consulted several fellow builders just to find that they too had been caught off guard the first time they had a go. Through a lot of research it became clear that the best way to avoid breaking the linings were to pre-bend them in some way. Some people suggested wetting them and clamping them on the outside of the sides and leaving them over night. Others suggested steaming them with wetted paper towel and a hot household iron. 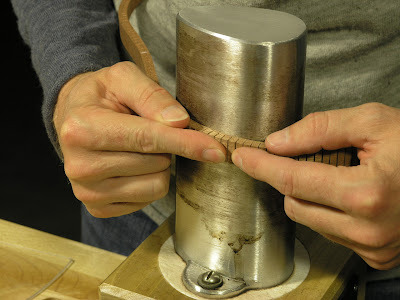 I experimented with a little jig to hold the linings in while heating them with a heat gun. In then end I resorted to bending them like the side, on my bending iron. At this point the linings were already in a somewhat bad shape: One had broken in two places, one had a fracture while the last two were still intact. I started by bending the 'three piece' lining since it was the most damaged. What the heck, why not break it a little more if it would come to that. It went quite well though, and stayed in three pieces after all. Second came the fractured lining. This proved to be a little more troublesome than the first one, as it was still in one long piece and therefor had to be handled with much more care. Despite this, I managed to turn that into a 'three piece' affair too. Now, two of the linings were broken in three pieces; At least there was some sort of consistency (I'm keeping a positive mind). Learning from my mistakes I managed to bend the last two linings without breaking either of them, though I did have a few close calls. I aimed at bending them into a C-shape with each bout slightly overbent to avoid having the yet-to-be-clamped part of the linings smearing glue on the sides. I did not worry too much about bending the waist area for the same reason. 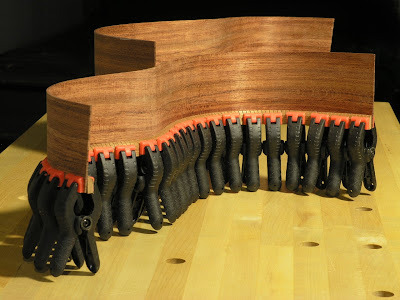 I decided to use the damaged linings against the soundboard, where the fractures would not be immediately visible, whereas the two intact ones would be used for the back where they could been seen through the soundhole. I clamped the side into the lining jig and started with a dry run with the three-piece linings to see if some unforeseen issued would pop up, but to my surprise it went pretty smoothly. It seemed as if all my struggles disappeared once the linings had been pre-bent. 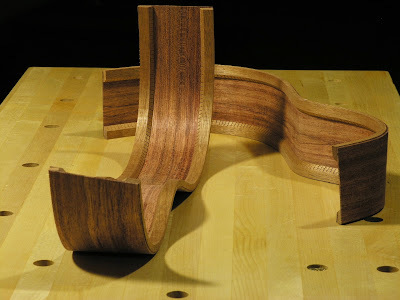 I started clamping the linings on at the waist and moved my way outwards along the upper and lower bouts respectively. I took the lining off again and applied a modest film of glue to it by dapping it on with a finger and glued it on the side with 3/4" plastic spring clamps, about 1mm proud of the edge. I butted the broken segments up against each other the best I could to disguise the fractures. Some ended up being barely noticeable while others sported a little gap. Oh well! 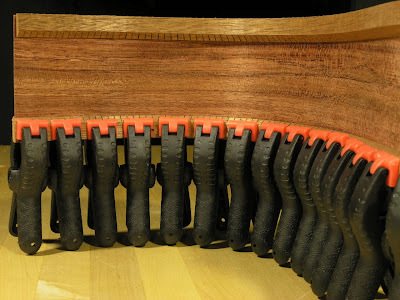 In retrospect I think the clamps, though they are very nice and have a good squeeze, were a little too wide for the job. As a result there are a couple of spots where the linings are not sitting tight against the sides. 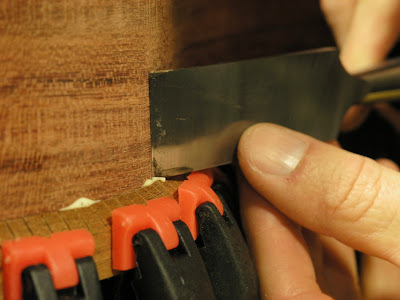 I tried to shave a couple of the swiveling clamp tips down but to little effect as the area where the jaws connect has a big 'knuckle' that prevents the clamps on closer together. Alternatively I could have made two long bent cauls to go on either side of the glue-up to even out the clamping pressure. I did experiment by applying the glue on the first strip with a newly acquired roller - the kind you use for lino printing - but even though it did leave a thinner, more even translucent film of glue on the work that produced virtually no squeeze out, it wasn't a particularly well suited tool for the fragile linings. However, I think I'll be trying it out again later on other processes. 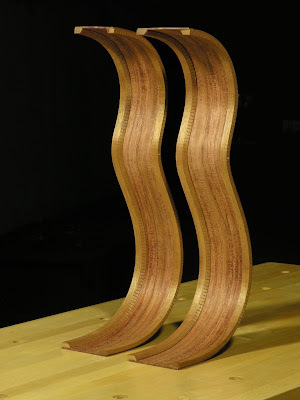 It might have worked very well if the linings had not been pre-bent and could have been laid down flat of a bench for support. 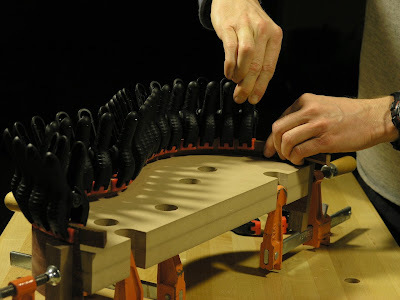 As this build is progressing I'm slowly becoming aware of how little glue is actually needed when you want two pieces of wood to stick together. When I started out, I was pouring it on with a thick coat that left me a huge mess of squeezed out glue to clean up afterwards. After about twenty minutes I cleaned up the excess glue with a sharp chisel. In Bogdanovich' book he recommends waiting only 8 minutes before doing this, but I find it to wet to work with. Maybe he works in a dryer and warmer environment, but for me fifteen to twenty minutes seems to work better. The back linings were installed in a similar fashion, including a dry run before the real deal. I worried it would be difficult to have the linings follow the undulating edge of the side made to accommodate the domed back plate. This did not prove to be a big problem, as it was relatively easy to manipulate the linings to follow the edge as they went around the bouts. The back linings were also installed 1mm proud. I have come to believe that installing regular kerfing and reverse kerfing must be two quite different beasts. 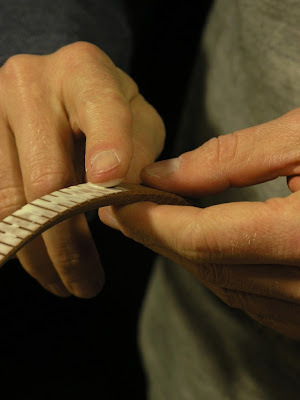 When installing reverse kerfing you have to bend the strips 'the other' way, making the bouts the tricky parts as the kerfing is opened up, making the thinner segments, the ones that have slightly deeper cuts, prone to breaking as they will take more of the bend than the thicker, less deep and stiffer cuts, while the waist, where the thinner sections only can bend so much before the 'kerf blocks' are butting against one another thus limiting how much each segment can bend, is a piece of cake. With normal kerfing I imagine the problem is quite the opposite and that the waist is where the breakage is likely to occur. And if it does, it is no big deal as the fracture will have little effect on the stiffness and cosmetically it is virtually hidden. I also believe there is a great distinction in the properties of regular and reverse kerfing (and solid linings for that matter). 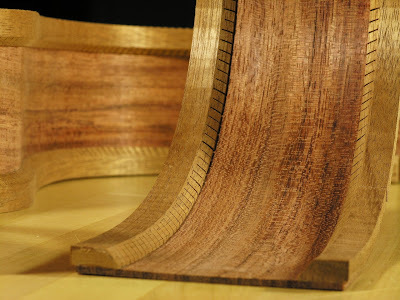 Apart from looks, reverse kerfing will inherently create stiffer and stronger construction than regular kerfing due to the fact that the uncut, solid part is on the 'outside' and not glued to the side itself. Whether this is something desirable, something that will make the guitar hold up longer and make it sound better is another matter. But, if stiffness is what you are after, then it is not desirable to have the reverse kerfed lining broken or cut into sections. Whereas it is likely it would ease the process of installing them, it would also defeats the purpose of having them reversed in the first place.